Ontologies describing the function of genes can be imported into SeqExpress in OBO format. To import the data, select the Function tab page on the left hand side of SeqExpress, and in the top table right click and select import ontology. The upper table of the function page is used to import data into SeqExpress, the middle choice menu is used to select a specific ontology and the lower tree displays the currently selected ontology. To import ontology data into SeqExpress right click on the top table and select the import ontology option. Then select the ontoology file you wish to import. The table gives information about the progress of the file being imported (an OBO file can contain a number of ontologies, each ontology is shown in a seperate line). Once the ontology file has been parsed, the genes are then indexed. Depending on the location of the gene annotations this process can take a few minutes, during the idnexing process the corresponding ontologies are coloured in blue. Once the data has been imported and the genes have been indexed the rows in the table will be coloured in grey.You can now select the ontology you wish to explore, this is done by using the choice menu in the center of the function tab. 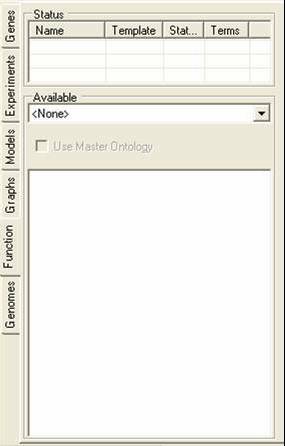 When an ontology is selected, using the choice menu, details about the ontology are shown in the bottom tree. 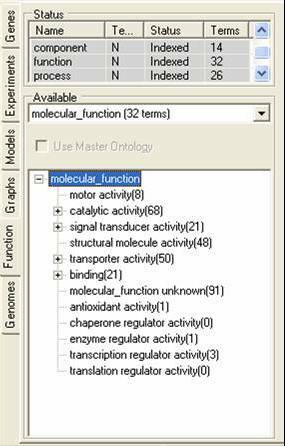 By selecting items in the tree, genes that have been annotated with the term are also selected (a number of alternative ontology views are also available).